Demystifying Reincarnation is an engaging read that analyzes how one of humanity’s oldest questions – what happens after death? – is most coherently and empoweringly answered through reincarnation. The book has three major sections: scientific, inter-religious and metaphysical. The first section makes the scientific case for reincarnation using evidence and theory: evidence drawn from past-life memories and near-death experiences, and theory built on the inadequacy of materialist attempts to explain consciousness. The phenomena of past-life memories and near-death experiences are presented using progressively stronger cases so as to anticipate and negate alternative explanation such as guesswork, prior general knowledge, exaggeration and fraud. The second section explains how belief in reincarnation has been present in all ages and in all the inhabited continents. A careful study of the core texts of Abrahamic religions shows that their present antipathy towards reincarnation originates not from their central beliefs, but from later historical accretions. The third section presents diagrammatically the Bhagavad-gita’s model of the self and evaluates the model’s explanatory potential for illuminating the aspects of past-life memories, near-death experiences and consciousness that remain incomprehensible within a materialist paradigm. Drawing from the Gita and Upanishadic texts, the mechanism of reincarnation is delineated. The book concludes with the positives of a reincarnation-centered worldview: its robustness in reconciling God’s goodness with the world’s inequities; its social inclusiveness in taking us beyond body-based discrimination; its trans-human inclusiveness in intuiting purpose and meaning for the existence of all living beings; and its profound optimism in changing our vision of the world from a jungle to a university, wherein we all are meant to graduate by learning lessons in immortal love. The book also has three appendices that deal with the problematic interaction of consciousness with matter, the possibility of machine consciousness and the phenomena of ghosts. Chaitanya Charan is a mentor, life coach and monk. Building on his engineering degree from a premier engineering institute in India, he complemented his scientific training with a keen spiritual sensitivity. For over two decades, he has researched ancient wisdom-texts and practiced their teachings in a living yoga tradition. Author of over twenty books, he writes the world’s only Gita-daily feature (gitadaily.com), wherein he has penned some 2,500 daily meditations on the Bhagavad-gita. Known for his systematic talks and incisive question-answer sessions, he has spoken on spiritual topics at universities and companies worldwide from Australia to America. 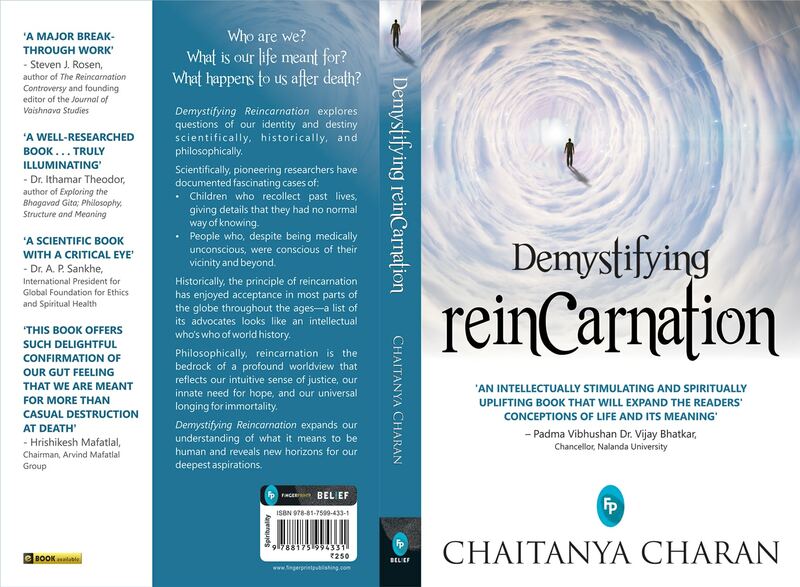 Demystifying Reincarnation is available at all leading books stores in India as well as online.